The shuttlebay was an airtight area that could be depressurized when a shuttle needed to enter or leave the ship. 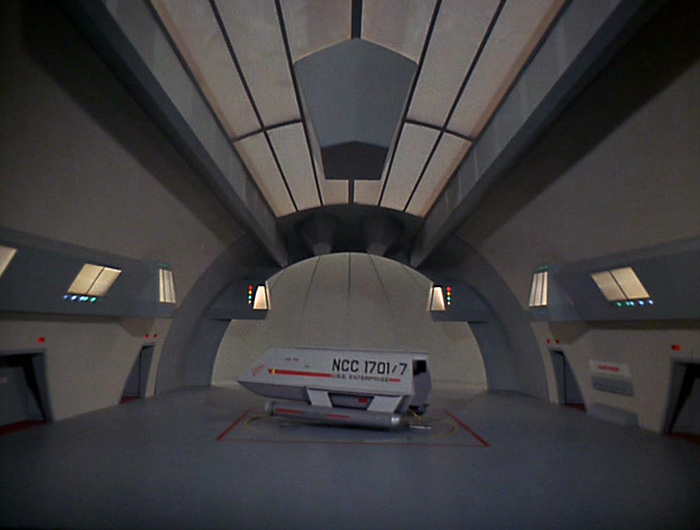 The shuttlebay on the USS Enterprise NCC-1701 served several important purposes. It's primary function was to provide a launch and landing area for Starfleet shuttlecraft, including the Enterprise's two shuttles, the Galileo NCC-1701-7 and the Columbus NCC-1701-2. The shuttlebay also acted as a storage and maintenance facility, where shuttlecraft could be repaired, refueled, or fitted. The shuttlebay, which was also referred to as the hanger deck, was designed to maximize the ease with which shuttlecraft could be launched and received. Located in the aft section of the engineering hull, the shuttlebay was a large, rectangular area, approximately equivalent in length to a football field. 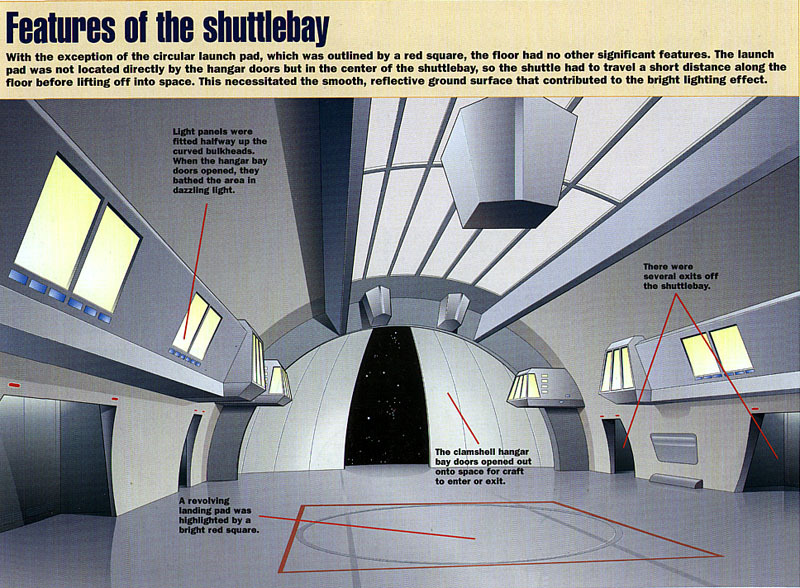 The shuttlebay featured a high ceiling with light panels, as well as a curved archway with clamshell doors through which shuttlecraft entered and exited. At least eight other light banks were positioned throughout the shuttlebay, making it extremely easy for approaching shuttlecraft to sight the landing area. When not in use, the craft sat on a circular pad in the center of the shuttlebay. This flat surface could rotate through 360 degrees to ensure that the shuttle could be maneuvered into a suitable position after landing and prior to its next takeoff. Most functions of launching or receiving a shuttlecraft were orchestrated from the bridge. When a shuttlecraft was ready to take off, the shuttlebay was depressurized and the clamshell doors were opened. The craft then moved forward along the floor of the shuttlebay and left the ground moments before reaching the doors. Once the shuttle was clear of the ship, the shuttlebay doors were closed and the bay was repressurized. Recovery of a shuttlecraft was essentially the same process in reverse. As the craft approached the starship, the captain would be informed of its imminent arrival. This was followed by a repeated warning to clear the hanger deck, followed by another announcement signaling the actual depressurization of the shuttlebay. Once the shuttle had come to rest and the clamshell doors were closed, the bay was repressurized and the doors separating the shuttlebay from the rest of the ship were opened. The crew and passengers of the shuttle exited using a small platform step that extended from the hull of the craft beneath the exit door. In 2287, when Hikaru Sulu was forced to land a shuttlecraft into the shuttlebay of the USS Enterprise NCC-1701-A without the aid of tractor beams, he claimed that it was the first time he had carried out such a maneuver. This implied that tractor beams were routinely used to ensure smooth shuttle dockings on the original Enterprise.